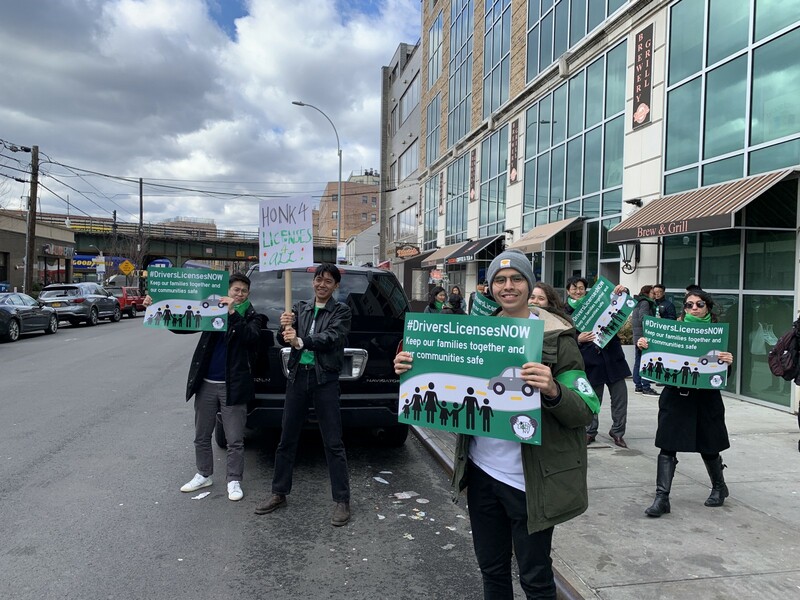 Give us the Greenlight: Driver’s Licenses for all New Yorkers! Undocumented immigrants currently face an impossible choice between making the necessary commute to work, school and home and keeping their families together. New Yorkers, especially those in areas underserved by mass transit, depend on driving to commute to work, school, or home everyday. Imagine being unable to pick up your kids after school, or drive them to doctor’s appointments, or being unable to commute for work. For thousands of undocumented immigrant New Yorkers, this is a stark reality because they are ineligible for state driver’s licenses. These New Yorkers are forced into an impossible situation where caring for their families puts them at an increased risk of losing them. It doesn’t have to be this way. State Senator Luis Sepulveda introduced legislation to expand access to driver’s licenses to all New Yorkers, regardless of immigration status. The State Senate and Assembly must pass this bill, and Governor Cuomo should sign it into law immediately. Sepulveda’s bill makes all New Yorkers, regardless of immigration status, eligible for a standard-class license from the Department of Motor Vehicles. The license would not only mean more registered drivers, but more registered and insured vehicles and about $57 million of increased revenue for the state, according to a report by the Fiscal Policy Institute. It would lead to increased public safety in the event of an accident, as greater trust and communication would be built between motorists, emergency services insurance providers.. Driver’s licenses would also lead to greater economic opportunity and security for undocumented immigrants, as many immigrant workers and businesses depend on driving in order to do their jobs. But the greatest impact of this bill is ending a nightmare scenario for undocumented immigrants — becoming separated from their families for simply trying to obtain a driver’s license. In 2012, K. S. Hwang went to a DMV branch in her home state of New Jersey to apply for a NJ license. She is an undocumented Korean American mother of two U.S.-born children who were only three and 11 at the time. She found it very difficult to support her family and send her children to school without proper identification, so she went in to apply, believing that she would be eligible as a long-term resident and community member. When the DMV found out that Hwang was undocumented, they denied her application and promptly called ICE who detained her and started deportation proceedings. Thanks to an outpouring of community support, she was later released and reunited with her family, and the MinKwon Center for Community Action has continued to represent her in her immigration case. There are many immigrants’ livelihoods in jeopardy, just like Hwang, because of their ineligibility to obtain driver’s licenses. K. M. Lee owns a small food supplier business and employs 30 people in his community. He needs to drive nine hours a day in order to keep his business running, and he obtained a driver’s license when he was first granted temporary status in 2012 through the Deferred Action for Childhood Arrivals program (DACA). But his status was unexpectedly terminated in 2017, rendering him ineligible to renew his license. Lee now faces the possibility of having to close down his business, which would leave him and his employees out of work. Both New York and New Jersey have pending legislation to expand access to driver’s licenses and preventing future immigrants from facing Hwang and Lee’s situations.We can soon join twelve states, Washington, D.C. and Puerto Rico that have already granted access to driver’s licenses. Will Albany sit behind and continue to allow immigrant New Yorkers to risk everything on the road or at the DMV, or will it give the greenlight and improve the commutes of all residents while generating millions in more state revenue? The answer is clear: driver’s licenses for all.